While the world around us is forever changing and evolving, the genuine Amish craftsmanship and timeless style of our Lynbrook Bed make for an invariable centerpiece - one that will withstand the test of time at the heart of any suite. 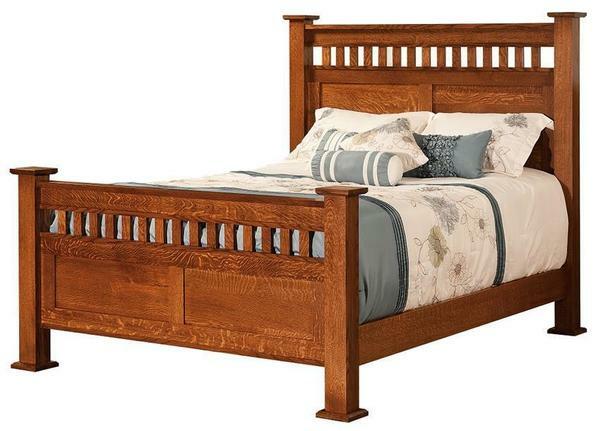 With a style is taken from the Arts and Crafts/Mission Furniture handbook, and tooled in a way that offers a subtle hint of rustic chic and contemporary simplicity, this bed is versatile enough to become a statement piece in any decor. As you take the time to study the details, you'll catch the classic Mission influence that is present in the head and foot boards, where a slat design is married to a double recessed panel below, capped with a flat trim along the top and mounted between large, square-post legs on either side. The overall look is both warm and inviting, but also regal and elegant in its own right. Joining the head and footboard are two solid wood side rails, connected with a series of dovetailed wooden slats with center support throughout - ensuring a lifetime of stability for your mattress and box spring. From the size and wood species to the finish and optional under-bed storage, you can choose the details of our Lynbrook Mission Bed to fit any space and complement any decor. Through the options menu above, choose your preferred combination and your new bed will be handcrafted, just for you. From there, a low flat-rate delivery fee gets all your bedroom furniture delivered to your home, ready for a lifetime of service and enough natural integrity to pass down for generations to come - just like the old days. Questions? Comments? Concerns? - We understand and we're here to help. If you have any questions about our Lynbrook collection, ideas for customizing this piece, or just wanted to speak with us and place your order by phone, please don't hesitate to call and speak with one of our furniture specialists at 866-272-6773. We are here to help you furnish a home that will be there day in and day out for a lifetime. Floor to Bottom of Side Rails Height: 7"
Floor to Top of Side Rails Height: 13"